FOOTBALL: A FIRST win in nine was just what the doctor ordered as Woking lifted the January blues down at Kingfield. Having endured an off-colour start to the New Year, goals from Scott Rendell and loan duo Ross Lafayette and Charles Banya were just the tonic against obliging opponents Alfreton as the Cards tasted league success for the first time since December 2. Speaking after last week’s limp FA Trophy exit, Cards boss Garry Hill challenged his players to end a run of three successive league draws and finish their campaign in style. “We mustn’t let the season go flat – we’ve got to turn draws into wins,” he said. There was a certain symmetry to Cards’ first league victory of 2015, having beaten opponents Town on the opening day of the season. And boss Hill was indebted to his recuperated skipper Mark Ricketts, who put in a man-of-the match performance in his first start since September. “If there’s anybody to get you going in the right direction again, it’s the skipper, Mark Ricketts,” beamed Hill. 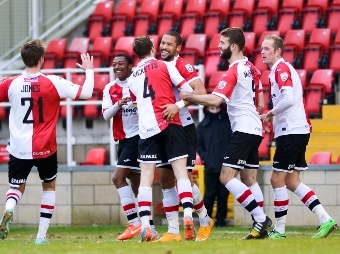 Alongside a revived Ricketts, one of Hill’s new guns – young Crawley Town winger Banya – also capped a dazzling display with his first goal in Woking colours, having returned on loan. New boy Banya and his team-mates will be hoping to take a taste of their home form on the road with them when they travel to league leaders Barnet this Saturday.